The Getzen 900s trumpet model came in the 1960s and in fact, the original model was known as the 900 Eterna Severinson trumpet. The Eterna Severinson became very popular in the 1960s and 70s and developed a fan following in the musical community. Due to great demand and popularity of this model, the Getzen company added some new features into it and came up with its new version called the Getzen 900S Eterna BB trumpet. In other words, it can be called as a vintage classic trumpet because the specifications have been the same but the Getzen brand has refurbished and reintroduced it as a 900s Eterna bb model with some new advanced technology features. It has a five-year warranty and a lifetime piston warranty which is transferable. It comes with valve oil and a soft cloth cover. Getzen is known for great valves so the user may not need to oil them too often. However, periodic oiling is advised to maintain the instrument in good condition. In fact, good lubrication of the entire instrument will lead to its long life. The trumpet comes along with two accessories which include a black wood shell carry case and a mouthpiece. The carry case is big and sturdy and prevents the trumpet from damage during transportation. It is also advised to keep the trumpet in the carry case when not in use. The Getzen 900s Eterna is a Bb key trumpet with a .460 inch bore which makes it a medium-large instrument. It has a standard lead pipe made up of nickel silver material. The same material is used inside the tuning slides. The 900s Eterna has a 4.75 inch two piece bell made up of yellow brass material. 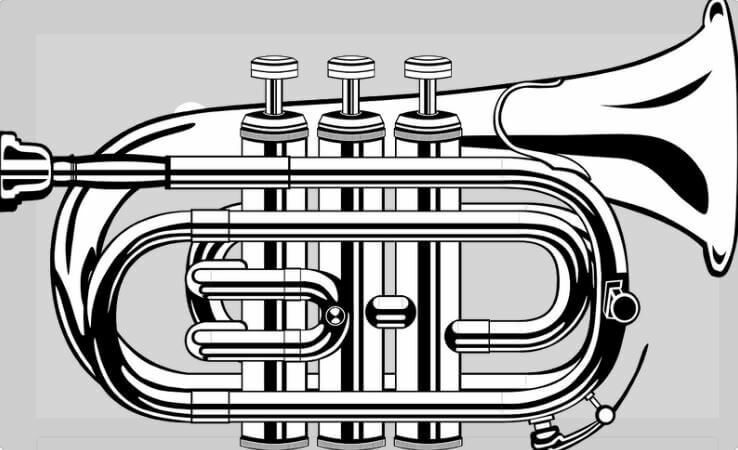 The trumpet has three hand lapping piston valves made up of nickel silver. It has a first valve slide adjustable with a thumb saddle and a third valve slide adjustable with a ring. The trumpet can play a fuller, richer and louder sound hence it is quite fit for those musicians who play at a high pitch for a longer duration. It is a lightweight trumpet so the players can hold and play for long durations without getting tired. The valves offer great fine tuning and can go fast if you want to play faster. The trumpet has a great silver finish and great sound quality. It is also known for excellent intonations. The instrument provides great tones which allow it to blend easily into different genres of music. It can be used in a jazz band or a symphony band or a college orchestra. Besides, that one can also take the lead with this horn or even go solo. The model is known for providing a free blowing experience to its users. The model has reduced air restrictions compared to its competitors which make it easier for musicians to play for longer hours. It may not be suitable for those who are not professional trumpet players. Someone who is starting out as a musician may not be skilled enough to use it to the best of its abilities and may also find it expensive. The finish may wear off from areas which too often come in contact with the player’s hands. It may also develop marks and dimples due to wear and tear over a period of time. A good finish may not necessarily mean a glare or a shine and the same is the case with the 900S Eterna. Hence some users may find it lacking in gloss. Since it is free blowing so some players may experience distortions at high volumes. Some players may not like the design and mechanism of the water key. Some trumpet players have tried to compare the sound of the Getzen 900S Eterna bb to that of the old popular Severinsen model but there have been mixed feedbacks pertaining to that — some like the older model and some like the newer one. However, it needs to be understood that the 900s Eterna bb is an evolved version of the same old model. Therefore the comparisons between the two models would not hold much relevance because of certain factors. These factors include the musician’s choices based on their artistic bent and perhaps certain musicians who were used to playing the old model and could not adjust to the newer one. All together, Getzen 900S Eterna BB comes with great history and brand value and is a great trumpet for professional musicians. The brand Getzen offers good post-sale support to ensure parts replacement in cases of wear and tear and damages due to accidents. The instrument boasts of positive customer feedbacks on the internet and the fact that there are people who have owned it for years is proof of its longevity.